With an array of impressive foundation funders, Next American City is an online long-form journalism site featuring articles on cities and the people and organizations working to make them better, more livable, and sustainable. For those of us who have spent our entire lives in nonprofit community development, it is a great mission, but sometimes a desire to provide uplifting stories about groups and people succeeding in urban revitalization can overshadow some important nuances. In “Welcome to Your New Government,” author Anna Clark describes what she identifies as community development corporations (CDCs) and their functions and accomplishments. She highlights the work of Midtown Detroit, Inc. as “being better at performing the role of government than government itself.” As the NPQ Newswire has noted, Detroit faces a fiscal nightmare, with Mayor Dave Bing, the City Council, the state government, and major foundations desperately searching for elusive answers. Midtown Detroit, Inc., which operates under the University Cultural Center Association, is an impressive organization. Its founder, Sue Mosey, is a powerhouse (though typically referred to as the unofficial mayor of Midtown, not, as Clark suggests, the unofficial mayor of the city), and Midtown is a crucial component of Detroit’s potential revitalization. But the notion of Midtown Detroit, Inc. as a community development corporation (a term that defies strict definition), much less one of several that are financially healthy and powerful enough to function in the place of a debilitated municipal apparatus, is a little odd. The board of directors of Midtown Detroit, Inc. is comprised almost entirely of institutional and business heavyweights from the Detroit Science Center, the MGM Grand Detroit Casino, the Detroit Institute of Arts, the Detroit Historical Society, the Museum of Contemporary Art Detroit, the Cathedral Church of St. Paul, and the Detroit Symphony Orchestra, among others, the major institutional players with direct stakes in the preservation and revival of the Midtown Detroit area. Clark compares Mosey’s nonprofit to Cleveland’s University Circle, Inc., a nonprofit that works on revitalization of the part of Cleveland that was home to Case Western Reserve University and the Cleveland Orchestra. 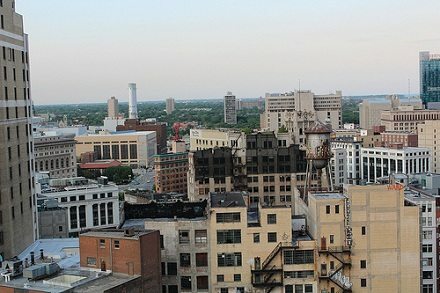 Like Midtown Detroit, University Circle, Inc. has done great things, but it is an organization that focused on protecting and building upon the presence of anchor institutions and revitalizing a critical corridor of this troubled city. These organizations are both examples of organizations whose constituency, so to speak, is major institutions, not community residents. But Clark also includes Midtown Detroit, Inc. in the lineage of the Bedford-Stuyvesant Restoration Corporation and other, more neighborhood-based, CDCs. Detroit has a number of CDCs, including one that Clark mentions in her article, Grandmont Rosedale Development Corporation, but they are typically resident-led and -governed, with boards predominantly comprised not of major institutional leaders, but lower income neighborhood residents. While there is no formal, legal definition of CDCs in most states, the HUD definition of “community housing development organizations” (CHDOs) in the HOME program tried to get there with a definition that was predicated in part on boards that were predominantly comprised by residents of the target neighborhoods. Under Mosey’s leadership, Midtown Detroit, Inc. has revived and preserved the Woodward Avenue corridor between downtown Detroit and New City, home to the Arts Institute, Wayne State University, and a couple of striking historic districts, but it is a nonprofit largely responsive to the institutional occupants of this district, not a CDC governed by (and emphasizing services to) lower income and working class residents. Based on our experience interviewing community groups in Detroit itself, we think most CDCs there would be flummoxed by the notion that they are taking the place of city government. Most of them actually count on the City’s access to Community Development Block Grant and HOME dollars as well as support from the City’s array of foundations, such as Kresge, Skillman, and others, to stay afloat. Some, such as Southwest Solutions in Detroit’s rapidly growing Hispanic neighborhood, appear to be making great strides, but there are many others just holding on, having significantly downsized over the years as the challenges of constrained funding and troubled housing markets—plus the near collapse of the automobile manufacturing industry—undermined the best of intentions and dedication.